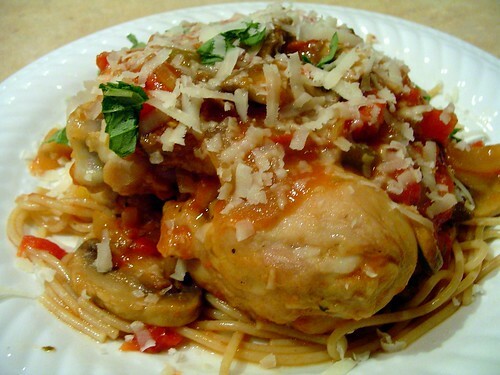 Chicken Cacciatore – Elly Says Opa! Tonight I made chicken cacciatore, which we had over some whole wheat spaghetti. Sprinkle chicken pieces with salt and pepper. If desired, dredge in flour. Heat olive oil in a large, deep saute pan. Add chicken pieces and brown on all sides. Remove from pan. Add onions, pepper, and mushrooms to pan. Cook about 4 minutes before adding garlic. Cook an additional minute. Stir in wine. Scrape up browned bits and allow liquid to reduce by about half. Add diced tomatoes, chicken broth, oregano, red pepper flakes, salt and pepper. Bring to a simmer. Return chicken pieces to the pan. Cover and simmer until chicken is cooked through, about 20 minutes (depending on what cut of chicken you are using), or as long as you want. Top with fresh basil and grated cheese.